Answers.com app for Windows 8 is available under ‘Social’ section of its app store. Here, in this Windows 8 Answers.com app, you will find more than 75,000 people actively participating in asking, answering, sharing, and learning on an Answers property. More than 60 million users have posted questions across 8,000 categories such as Animal Life, Cars & Vehicles, Food & Cooking, Home & Garden, Entertainment & Arts, Health, Politics, and many more. The questions and answers platform lets you create new content related to trending topics, world events and everything in between. In order to post a question or answer, you need to create an account and login to it. It’s just a matter of few seconds to go with the process. Each category has been sub-divided into various different categories. Also, you will find a separate column for Answered and Unanswered questions. Let me quickly point out the main features of this Answers.com app for Windows 8 below. Over 75,000 people actively participate in asking, answering, sharing, and learning on an Answers property. More than 60 million users have posted questions across 8,000 categories. Categories such as Animal Life, Cars & Vehicles, Food & Cooking, Home & Garden, Entertainment & Arts, Health, Politics, and many more. Lets you create new content related to trending topics, and world events. Need to create an account in order to post a question or answer. Lets you improve existing answers. Each category has been sub-divided into various other categories. 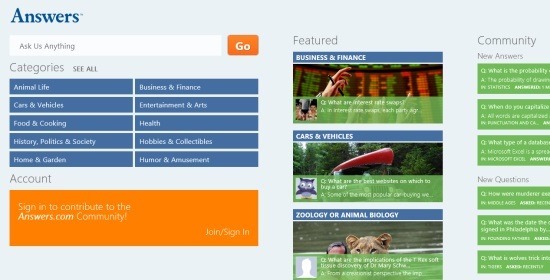 As you launch the Answers.com Windows 8 app, you will find a box where you need to input your question and a list of related questions will arrive on the screen. Just below the search box, you will see a list of categories, and then account. At the right side of the screen, you will find ‘Featured’ section and ‘Community’ section. You can find the app under ‘Social’ section of Windows 8 app store. It’s very easy to download Answers.com app in Windows 8. Also, check out our posts on Apps to ask questions, Search Engine Apps, and Questions App. Open the given link in IE10. Click ‘View in Windows Store’ to open the app in Windows 8 App Store. Now, you can easily proceed with further installation steps. In short, Answers.com is a good useful Windows 8 app where you can ask and get the answers of almost all types of questions. Go ahead and download Answers.com app in Windows 8.